Hello Tampa, Melissa here to talk about a really cool event at the Glazer Children’s Museum on Sunday, February 13th. 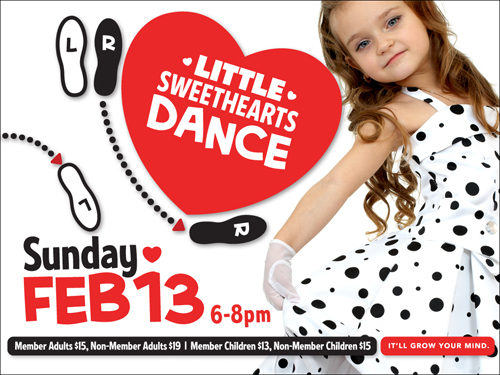 Valentines Day shouldn’t have to only be about adults, and with the Glazer Museum’s Little Sweethearts Dance, it doesn’t have to be! This year you can accompany your little sweetheart to their first ballroom dance. There will be light buffet and refreshments, but don’t fill up too much before you get to strut your stuff on the dance floor. There will be a demonstration period for children and adults alike to learn some basic steps before stepping it up to the dance floor. Moms, dads, and even grandparents are invited to show their little ones just how close to your hearts they are. Make your little sweethearts Valentines Day special and reserve your spot now. Space is limited; reservations can be made by calling 813-443-FUN1 (3861). The dance goes from 6-8pm. Pricing varies, depending on whether or not you are a member of the museum. The pricing and other info can be found online or by emailing the museum at reservations@glazermuseum.org. And of course, remember to keep checking back here for more about Tampa and Tampa Bay Area Events!